After sparking a minor hubbub with my criticism last week of Gillette‘s PR tactics, I felt obliged to actually attend the company’s much-hyped event in Manhattan this morning. The M3 Power, fitted with a battery (from Gillette’s Duracell, natch) and tiny motor, delivers a pulsing action — which, Hoffman says, “stimulates whiskers up and away from the skin, so the blades cut in just one stroke.” Uh-huh. Plus, the blades are coated with a “thin uniform telomer” that doesn’t diminish with use. Plus, your face gets a gentle massage. To my earlier comments — and to the comments they provoked: Was the original PR gambit worth the expense (and waste)? 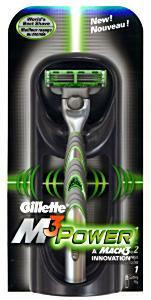 I gotta say, in the scheme of the shaving world, the M3 Power is a big deal, and it’s a franchise bet for Gillette. So it seems worth it to me to throw more than a little money at publicity that will influence the influencers (except, um, maybe the ones who take pot-shots). The design of the event itself, and of the new product, were more or less in synch with the original pitch. The electric-green plexiglas of the invitation was echoed by accent lighting in the hotel ballroom and plexiglas covers on the giveaway notebooks — and by electric-green (“the color of high technology,” apparently) highlights on the razor. The message — this is about technology, and it’s a big deal — was reinforced at every turn. So, I still think the aluminum-rubber-plexiglas invite was wasteful — but I now concede that it wasn’t inappropriate or dumb. Sadly, “due to the heightened competitive environment,” as Hoffman grimly explained, Gillette wasn’t handing out free M3 Power samples this morning. Dang. Maybe it’ll remember us influencers closer to the May 15 launch. And if they want to put one in a fancy box, I’m cool with that.